French cable layer Nexans has won a EUR37m contract to install a submarine cable in Norway at a sea depth of 526 m, breaking its previous world record of the world’s longest and deepest 420 kV XLPE submarine cable system. The cable will complete the last construction stage of a new BKK power connection in Western Norway, supplying power to around 200,000 households, businesses and industry facilities in the Bergen region. The new 420 kV connection between Modalen-Mongstad will ensure power supply to over 420,000 residents, businesses and industry facilities throughout the region. With the extensive archipelago landscape on the west coast of Norway, Nexans’ submarine cable will cross the Fensfjord, which is approximately 8 km wide and 526 m at its deepest point, thus breaking the record of the world’s longest and deepest 420 kV XLPE submarine cable system. The previous record was also set by Nexans during the construction of the first part of the connection between Kollsnes and Mongstad at the end of 2016. Nexans will develop and produce the submarine cable at its facility in Halden, Norway. 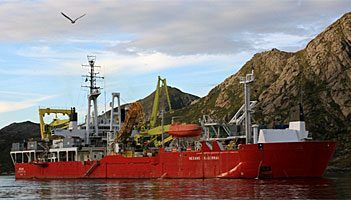 Installation and work on the seabed will be performed by Nexans’ own cable-laying vessel Nexans Skagerrak in the summer of 2019.